There was a rough patch! Yes, my counts were low. And they got lower. And in the wee hours of Thursday morning, I woke up with a fever. I called the nurse right away. I knew I had no defenses with which to fight this. They ran blood cultures and started me on antibiotics right away. But it was no fun. I had the chills pretty badly, off and on all day and I felt so horrible and I don’t even have to words to describe it. I was still allowed to have visitors, though, which surprised me. So it was my choice. I had a bunch on the schedule. I decided to go for it. I figured if I was still feeling bad, they could hold my hand. I was glad I made the choice. Pete and Erin came in the morning. I was excited to see them because I hadn’t seen them in several weeks. Marie, Paula, Pauline, Kerry and Karen came in the afternoon. Although I had some chills during both of the visits, I got through the day much better than I would have alone. It really helped to pass the time. I didn’t get a pic with Erin and Pete but I did get one of the ‘gang of 5’ that filled my room in the afternoon. At this point, I was pretty bundled up. Fortunately, the worst was over in a day. Although I still felt a little weak on Friday, my temp stayed in normal range most of the day. As I write this Saturday morning, I feel great! Other than having no appetite at all, I feel pretty normal. I do not have the nausea that I had last week but I rarely feel hunger and I get full if I eat a few bites. I’m sure that will come back over time. I just want to be able to enjoy food again at some point. I fantasize about chili rellenos. And alcohol? Last thing on my mind. I’m sure that will come back! Above, some pretty cool stuff from my friends. The cover is for my hepa mask. Now I can wear one with chickens! In other news, I had a nice visit with my good friend Jan on Wednesday. And last but not least, a hair update! This is my pillow this morning. I lost some large clumps in the shower yesterday. It’s definitely on the way out. It’s OK. I’m prepared. Or maybe I just think I am! There will surely be more about this in the next few days! This is when the &$)@@&) gets real! So, I haven’t checked in in a while. 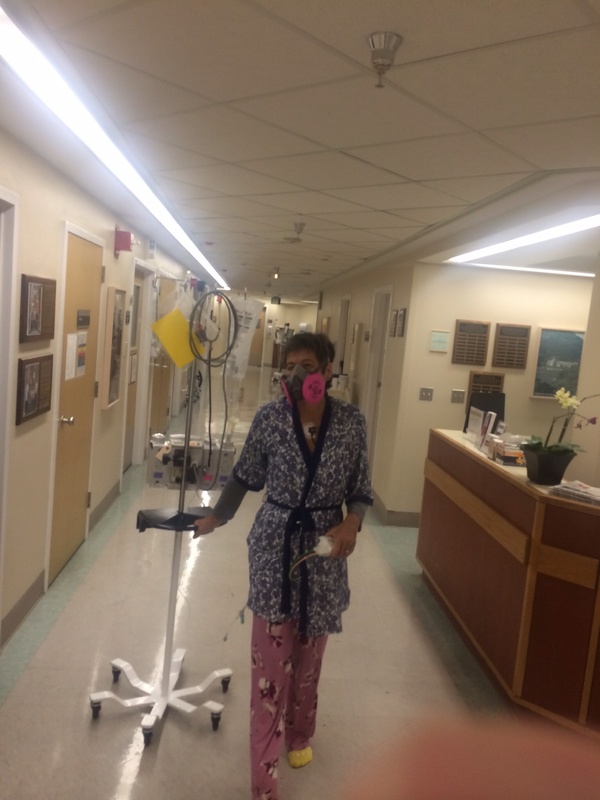 I was hoping to update this blog every day I was in the hospital but I think that was setting the bar a bit too high. I’m just going to do what I can. Because apparently if you throw enough chemo at someone and start the process of killing off most of the cells in their bloodstream, they don’t feel so good. I can walk around. I get up. I just have no desire at all to eat anything. My room service menu is getting very lonely as I have not looked at it in several days. Tonight we are going to try Ambien to see if I can sleep with that. It is sort of like having a really bad flu. After you’ve been run over by a truck. 🙂 Oh, but I’m being overly dramatic. I knew these days were coming and it is pretty much what I expected. I’m just wondering if I will be able to pull off a couple of Facebook posts I have planned. On second thought, of course I will, there is no question in my mind! I did not bring all these props for nothing! So how did the last few days go? After some more chemo on Sunday, had a great visit with Paula and Mike We got in 32 laps around the unit. On Monday, Marie came by and we got an accurate measurement of the ‘course’. It does seem to work out to 22 laps being a mile, so we were satisfied. 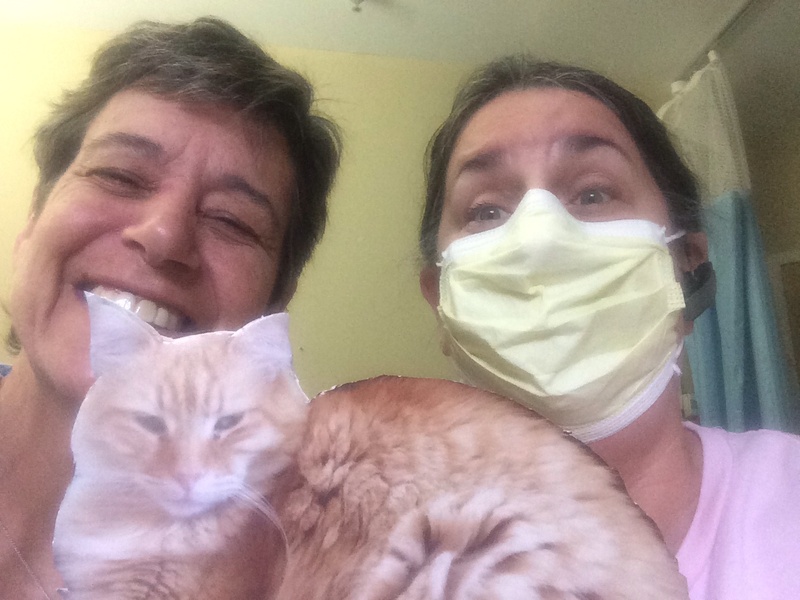 On Tuesday morning, I got the actual transplant of my cells. Howard was here and several people were in the room. I don’t remember much. I went to sleep. 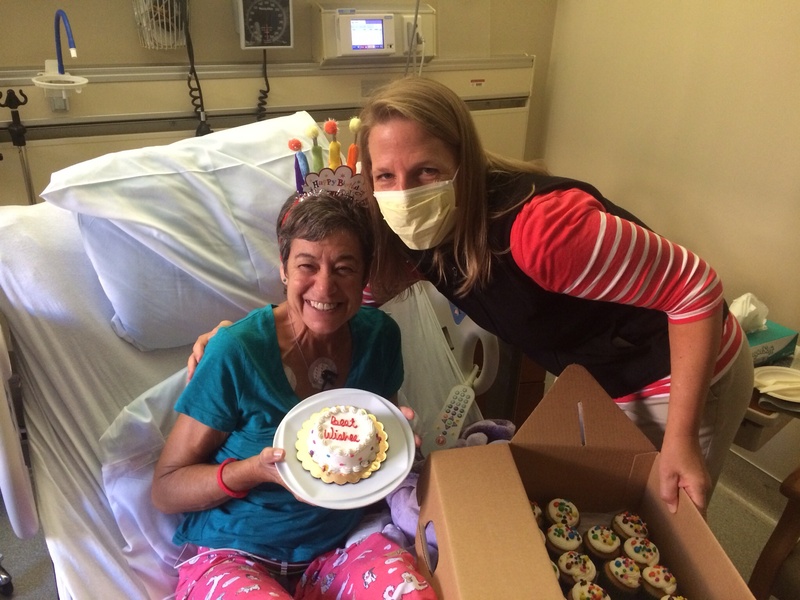 Later Anne stopped by and was here when the nurses brought in birthday cake. August 19th will be my new birthday…well, I get two of them each year now! Since then, I haven’t been doing very much, so if you’re looking for an entertaining blog, this may not be your location of choice! Not that I give up easily. I promise you, I will always try. 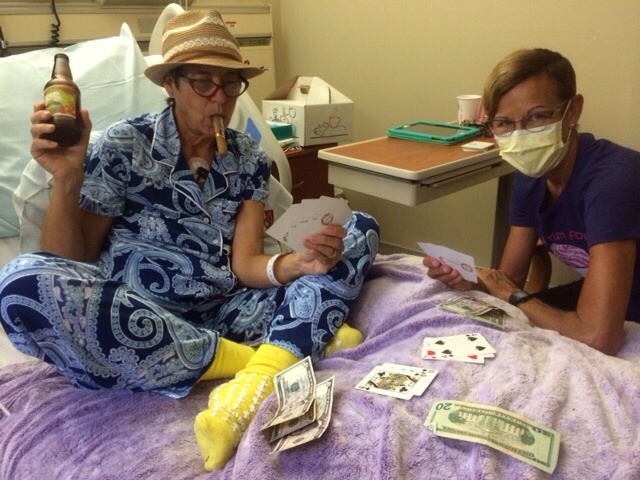 Below, a little fun we had…yep when the nurses are away the patients will play! I’ll write again soon. I’ll be here. I’m not going anywhere anytime soon. I’m doing nothing and it’s taking me all day to do it! I have started this post several times, but I keep getting interrupted in mostly happy ways! I am now in the hospital. I am so thankful for the many options we have to communicate. 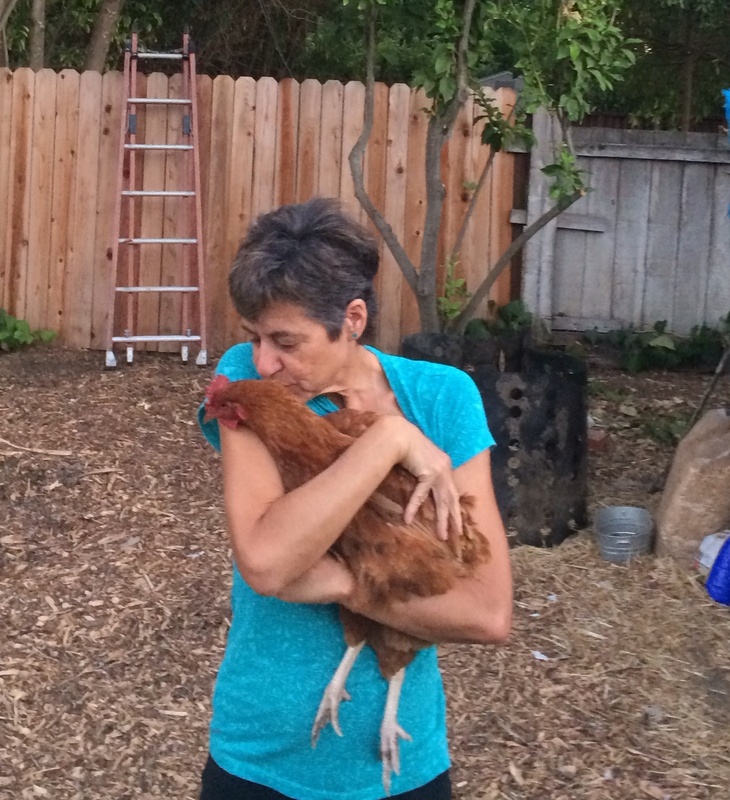 I’ve been busy on Facebook, with texts, the chicken cam, face time, and even, oddly enough, phone calls! And when I’m not doing that, I’m getting my vitals taken. I have not written in over a week. There was a long gap there with not a lot going on. I did try to keep busy by going to spin, and running on the rim trail. I spent most of this time trying to get the business ready for my absence. I am happy to say I was able to get in Movie #3 for the year! I had a fun evening with Paula and Anne. We saw ‘The Hundred Foot Journey” and I loved it. It was a beautiful movie. A feast for the eyes. I am fascinated by all things French and the setting was lovely. Add in a little spoken French, sensual food, and actors with beautiful eyes, and I found it quite filling. Meanwhile, back in the States….. Yesterday, we waited all day to find out when I was supposed to come in. It did give me a bit more time with the family. But before I knew it, my adventure became real and I had to say goodbye. 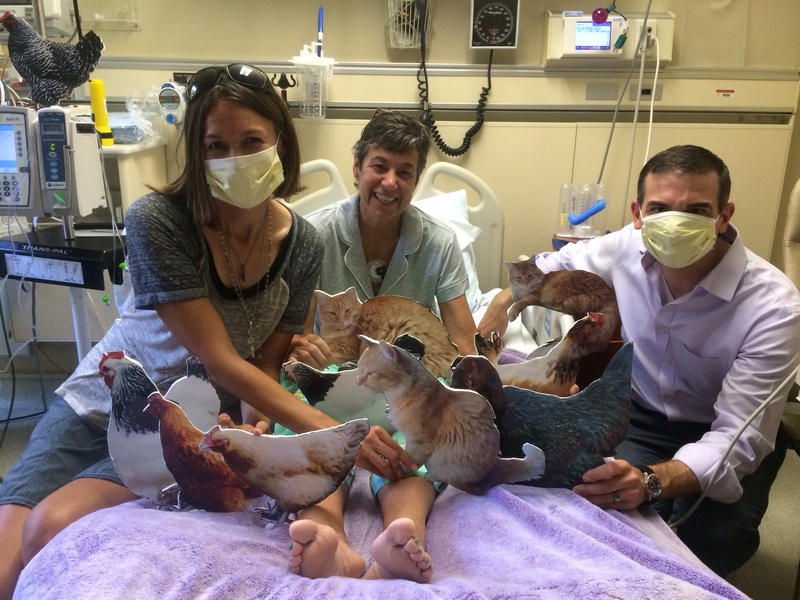 The kids will be able to visit me, but it was with the pets that I shed a few tears. I finally got here at 9:30 and as I write this, I have been here just about 24 hours. I was originally scheduled for chemo but it was so late, they decided to do it today instead. I got my infusion this morning. It took about 20 minutes. I am feeling fine. I do not expect the side effects to kick in yet, but I’m ready for them. I will have the second dose tomorrow. In the meantime, I am enjoying my stay. The nurses are wonderful! I am quite pleased with the food. That might not be saying much. My standards are low. I love hospital food and airplane food. But this is pretty good. I have a menu and I can order from it like room service. I call it in and it shows up within 45 minutes. 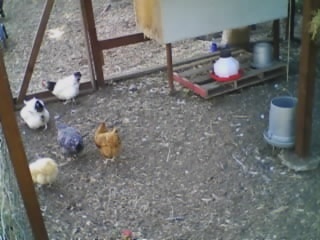 And as far as my pets…the chicken cam is a success!Below is a screen shot I took of some of the girls. I can hear the clucking, and I love it! This afternoon, I did do some laps around the unit. I had time only for 12, before I had to get back to the room. It was a bit tedious with an IV pole and a somewhat heavy heart monitor, for which I had no pocket. 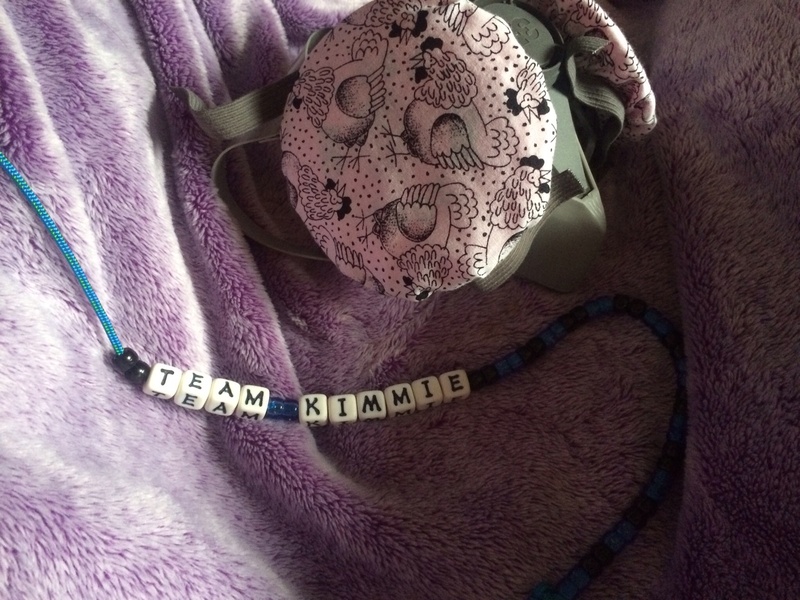 But a slightly-tired-from-exercise Kimmie is a happier Kimmie, so I did what I could do. And if you really want to know what this is like…..several times over the last year I have to do 24 hour urine tests. Yep, you have to collect it in a jug for a whole day and turn it in to the lab. (You get used to it!) Well, this is like the 408 hour urine test. They aren’t checking it for protein but they are measuring every drop for my entire stay! And with all the fluids I’m on, I’ve set a new PR for output today! TMI? Hey, you knew there would be medical stuff on here, right? I’ll try to be gentle but we can’t have any fun without some gory details, you silly goose. So, if you’re still with me, buckle your seat belts. We are flying now. I can’t wait to see what tomorrow brings! Success on a Cellular Level! It is warm, Tuesday evening, as I sit out here in my backyard, my feet resting on our fire pit. It has been unusually muggy here, not at all like our typical Contra Costa weather in the summer. I haven’t seen the sun all day, so my brain seems to translate that into it being it too cold to come outside and write. But no, it is calm and peaceful and just the right temperature now. The chickens have gone to bed. The crickets are singing. It’s been an eventful week, with hundreds of miles driven back and forth to Stanford. Today, I got to stay home. And it was so strange that it threw me off completely! I am sure I will adjust. I’ll get back to my normal routine, and it will be time to go again. After my central line was put in, I began the daily trips to receive my Neupogen shots. On Friday evening, I began injecting myself. I may be a little on the crazy side, but I felt a sense of accomplishment in being able to do it. A positive, in a sea of potential negatives. My friends, Erin and Margie, and my sister Joanne, all pitched in to be chauffeurs for my appointments. It gave Howard a break and me some variety. Thanks everyone! Sunday was party day! What a day! I was a little worried earlier in the week, as my schedule had been adjusted and I knew I would be receiving the Neupogen this weekend, instead of the weekend before. This medication can cause bone pain. In fact, I was almost hoping it would…that indicates it is working, as the increasing stem cells get crowded and push to come out. I was taking Claritin. They don’t know why it helps, but it seems to. I can’t say whether it worked or not, but I flew through this whole thing with a few minor aches and that was about it. The party was wonderful. Although it was still 12 days ahead, it was my send off before hospitalization. So many good friends! I didn’t want to, but I cut my hair short. I hate it. I hate the way I look. I loved having long hair. But I had to be a big girl. I felt it would be a good transition to baldness and I would be able to donate my hair, about 8 inches worth, if I were proactive. Doing it in front of friends was better. 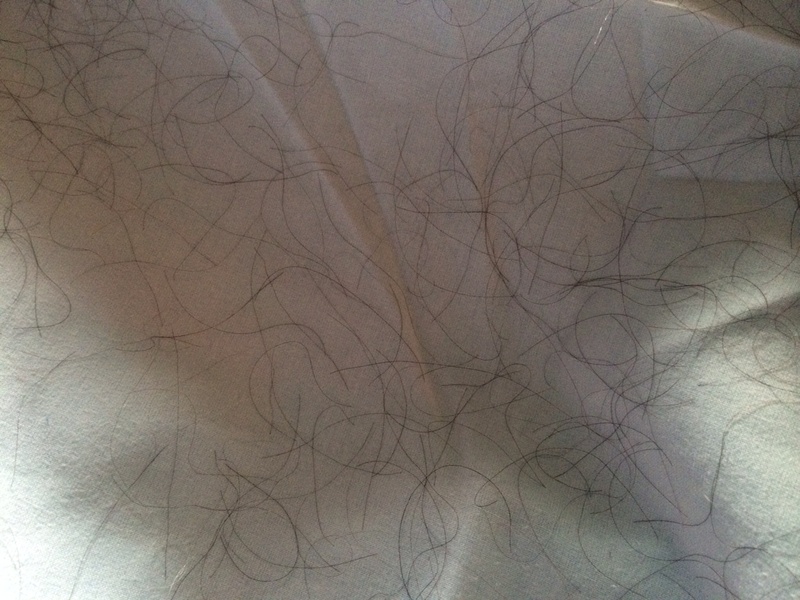 It wasn’t as drastic as the head shaving that I had originally planned, but it was still hard. I didn’t cry. I laughed because all my buds were with me. I can do anything because I am loved. Howard got a buzz cut in support. He loves his hair too. I know it wasn’t easy for him, but he did it. I had a wonderful time. I am thrilled that so many people came. I am so blessed. My friend Lori, who I had not seen for 26 years, came a long way to see me. That was so special to me! 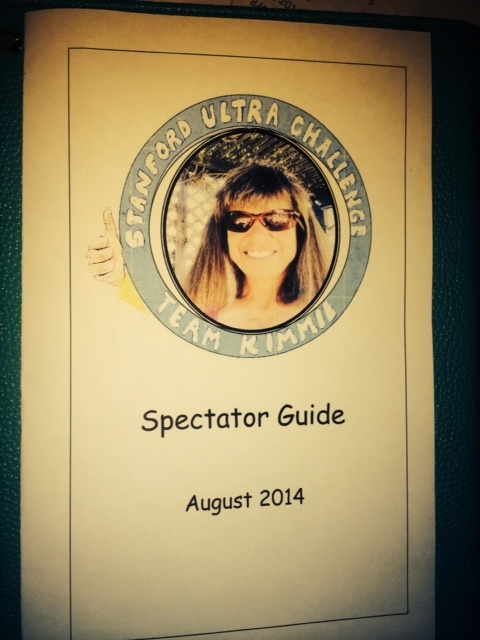 I had put together a “spectator handbook” for my little challenge. It was a way to combine all the info, such as my schedule and contact info, in one little package. If you would like one, simply message me with your address. I was up at 4:30 the next morning, as Erin and I had to be at Stanford at 7:30. 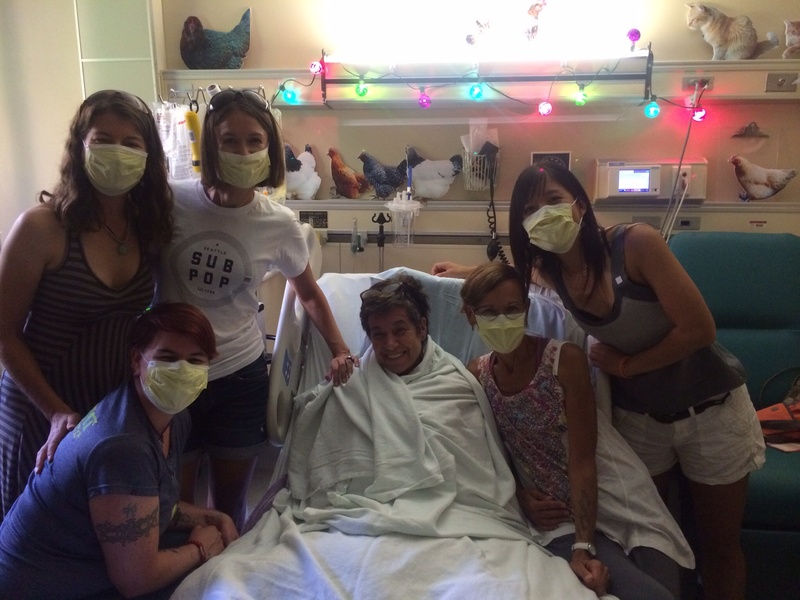 Monday was the first day of stem cell collection! Portia (that’s the name I picked for my central line) and I were hooked up to a machine for four and half hours, while my blood was circulated through it. I slept for a while, then chatted with Erin and soon our friend Christy joined us on a work break. I had worried that I would have trouble being made to sit still for so long, but of course, it flew by. Ya know…it’s that people thing…when you have your people, you can do it! I wouldn’t know if they collected enough cells until later that day. Just as I started to check my cell phone a few hours later, it rang. I had done it in one day! Tons of cells, no return trip required! This process could have taken 5 days. The Neupogen worked, in spite of how good I felt! So, now I’m done for a while. I feel a bit lost without having to make that trip. But there is plenty to keep me busy. A little work, a little coffee…tonight was dinner with my friend Marie. Wonderful! I’ll check in again soon. I feel like today was the beginning. I have finally started the process! My curiosity about what is to come far outweighs any fear or dread that I might have. I’m not sure why that is. Maybe it is because I have had so many positive experiences so far. I have met some pretty wonderful people. I have grown closer to the people who have already been in my life. My life is certainly different right now, but that doesn’t mean it’s bad. I’ve got it pretty good. Truth be told, I haven’t been through very much so far. Sure, my blood has probably been drawn about 85 times in the last year, but I don’t mind that. I have had some biopsies that were not too much fun, but they were all very quick. When I was on chemo, I called it “Chemo Lite”. It hardly affected me at all. I am in more discomfort now, after what was done today, than I have been this whole time. And yet, I’m going to say that my pain level is between a one and a two. I’m just a little sore. I know that the hardest thing to come is probably the week or so after the high dose chemo, but I know I’ll get through it. So what was done today? I’m still deciding on its name, but I got a new little pet who will be with me until about 3-4 weeks after the transplant. 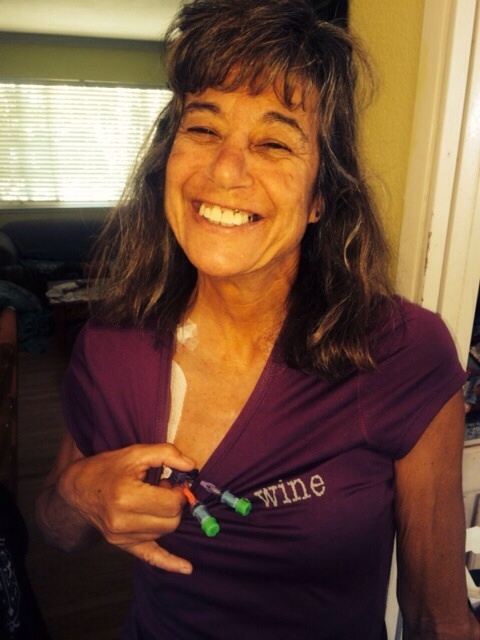 It’s my central venous catheter, or central line. It will be used for everything they use an IV for, but I won’t have to have one in my arm, or constantly get poked. I was sedated for the procedure, as they had to put this tubing into a large vein near my heart. It is sutured into place and the top part of it is securely taped down. There are two “lumens”, the little ends where injections can be given. The lumens are kind of swinging freely…I’ll have to tape those down for running or spin class. No, really, my doctor said it was OK. Silly doctor. She knows not that she is feeding a little monster. Today was my second visit this week to the big S. I had to go yesterday for lab work, X-ray, EKG and a meeting with the doc. Tomorrow I go back for another Neupogen injection to increase my stem cells, and will be on those at least until Monday, when the first collection will take place. Each morning, I’ll go in, presumably so they can keep an eye on me. Each night, I’ll get to inject myself. What I’m willing to do to add to my list of fun skills! I start that DIY project tomorrow evening. I’m going to bed soon. Erin will pick me up at 5:30 for another exciting trip across the bay. Watch out Stanford, here comes Double Trouble!